The film ‘Red Cliff’ is a Chinese epic film based on the Battle of Red Cliffs and events during the end of the Han Dynasty and immediately prior to the period of the Three Kingdoms in ancient China. Red Cliff is directed by Hong Kong filmmaker John Woo, of ‘Broken Arrow’, ‘Face/Off’, ‘Mission: Impossible II’, and ‘Paycheck’. The screenplay was co-written by John Woo, Chan Khan, Kuo Cheng, and Sheng Heyu. This film is an adaptation of Guanzhong Luo's novel "Romance of the Three Kingdoms". The film has collected roughly $44 million and creates Chinese box office history record. The film is expected to be released in two versions. Within Asia, Red Cliff is to be released in two parts totaling over four hours in length. The first part was released in July 2008 and the second in January 2009. Outside of Asia, a single 2½ hour film will be released in 2009. The film stars Tony Leung Chiu-Wai, Takeshi Kaneshiro, Zhang Fengyi, Chang Chen, Hu Jun, Lin Chi-ling and Zhao Wei. With an estimated budget of US$80 million, Red Cliff is the most expensive Asian-financed film to date. In 208 A.D., during the final days of the Han Dynasty, Prime Minister Cao Cao convinced Emperor Han that the only way to unite all of China was to declare war on the kingdoms of Xu in the west and East Wu in the south. Thus began a military campaign of unprecedented scale, led by the Prime Minister himself. Left with no other hope for survival, the kingdoms of Xu and East Wu formed an unlikely alliance. Numerous battles ensued, both on land and on water, eventually culminating in the battle of Red Cliff. 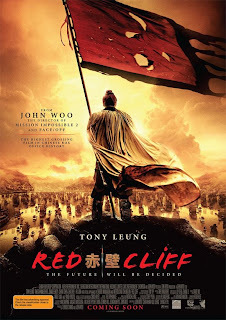 0 comments: on "Stunning New Poster for John Woo's Red Cliff"